March 8th 2017 saw young people spilling onto the streets for abortion rights, many thousands of whom had walked out of schools and colleges to join the action, often participating in their first protest. The age profile was discernibly younger than even the youthful March For Choice demonstration in September 2016. The mood was defiant – on the ROSA contingent of the march the “Not the Church, not the state…” chant was morphed into “F*** the Church, f*** the state…” by the throngs of young people around! An estimated 8,000 people heed the Strike4Repeal call to come onto O’Connell Bridge in Dublin city centre from 12pm, effectively shutting down traffic-flow in the city for hours. 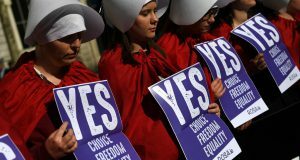 Later on that evening 12,000 marched from the Garden of Remembrance to the Dáil as part of the Coalition to Repeal the 8th Amendment’s March4Repeal. About 1,000 people filled up Central Bank in Dublin completely to greet ROSA’s Bus4Repeal at 3pm. The fact that the 40 ROSA activists on the Bus had to walk to Central Bank because the Bus4Repeal couldn’t get into the city centre because of the demonstrations did not deflate the welcome of ardent cheers received. Other significant protests, student walkouts and marches took place in numerous other locations across the state. 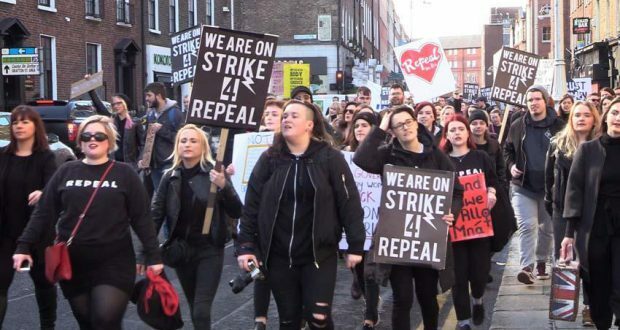 The Strike4Repeal call struck a chord with young people, precisely as it resonated as a bold and radical action. 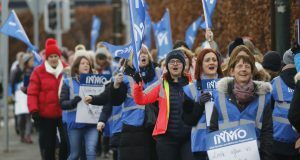 It shows the possibility for more organised and mass school and college student strikes to be a weapon in the fight for abortion rights. Many workers also took the day off work, and many other organised with their colleagues to collectively wear black, all showing the possibility for further action of workers as part of the repeal movement. The Citizens’ Assembly is due to decide on its recommendations towards the end of April, and will then take a few weeks to produce a written report. This will go back to a Dáil Committee to be further pontificated on, meaning further delay. It’s most likely that some type of referendum will be proposed by the Assembly. However, the pervasive attempt by the media (eg. The 3 March Irish Times poll that asked people if they wished to ‘replace’, rather than ‘repeal’, the 8th) and political establishment to limit the scope of change and infer that full repeal, that is, deletion of the 8th would somehow not pass or be accepted may be reflected in its recommendations. This argument flies in the face of not only consistent poll results for years, but also the direction of travel of the attitudes of the population that are moving robustly in a pro-choice direction. No matter what the Citizens’ Assembly recommends, there should be another major day of action in May for full repeal/deletion of the 8th named similar to the Strike4Repeal action. Furthermore the whole pro-choice movement needs to begin planning and building for the biggest national demonstration for repeal and abortion rights that the state has ever seen on the 5th anniversary of Savita’s death, 28 October 2017.